The Intergovermental Panel on Climate Change (IPCC, 2009) indicates that rising temperatures, drought, floods, desertification and weather extremes will severely affect agriculture, especially in the developing world. While the convergence of population growth and climate change threatens food security on a worldwide scale, the opportunity also exists to address the pernicious threat of famine. Indeed the prerequisites to develop a globally coordinated effort to ensure long-term food security are available for the first time in human history. Namely: (i) the realization that agricultural problems worldwide have a common scientific basis; (ii) a vast and expanding database encompassing all disciplines that impinge on agricultural productivity; (iii) a de facto network of agricultural scientists working in almost every country in the world; and (iv) unprecedented opportunities for communication, data analysis and investment. These elements, the indisputable fruits of an industrialized global economy, were not available to our predecessors, which is probably why climate change in history spelt death. 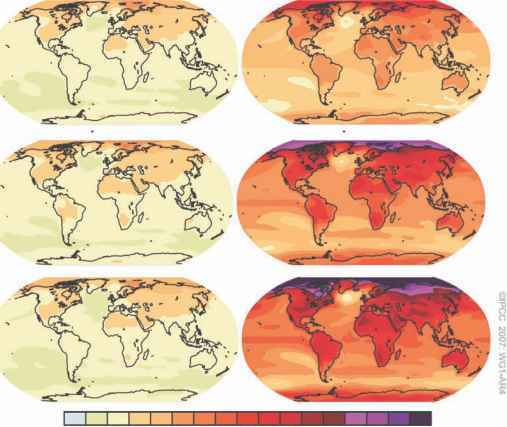 For example, analysis of high-resolution palaeoclimatic data - ad 1400-1900 -showed that in both Europe and China, long-term weather patterns were strongly linked to the frequency of wars (Zhang et al., 2007), while recent analysis in Africa indicates that global warming increases risk of civil war (Burke et al., 2009). Agricultural researchers worldwide are, therefore, working to mitigate these and other effects of climate change to increase productivity within a finite natural resource basis. Assuming investment is forthcoming, maintaining food security in the face of population growth and climate change will require a holistic approach that includes stress-tolerant germplasm, coupled with sustainable crop and natural resource management as well as sound policy interventions. There will be duplication of effort as regions struggle with parallel challenges; however, judicious public investment can reduce redundancy of effort permitting local organizations to focus on adaptive research. The Green Revolution was precipitated by a sense of urgency about famine in South Asia, yet has benefited millions of farmers worldwide, especially in resource-constrained countries (Lipton and Longhurst, 1989; Evenson and Gollin, 2003). Although these impacts were achieved with modest investment, the more universal problem of climate change will require backstopping from a larger segment of the scientific and development assistance communities if predicted levels of demand for staple foods are to be met under progressively less favourable conditions (Federoff et al., 2010). The topics in this book have been selected to cover the broad range of disciplines that will need to be implemented as part of a consolidated research effort to maintain and increase crop productivity in unpredictable environments.